A COUNCILLOR sought legal advice after being accused of dumping rubbish for a publicity stunt. Labour’s George Davies and community activist Debbie Parkinson called in town hall waste disposal workers after angry neighbours told them about a mountain of dumped furniture in Standish. It is believed that a resident moving house decided to save on removal bills by abandoning the unwanted bed, sofa, wardrobe and cupboards at the kerbside instead. But the pair have now consulted lawyers after being accused of being the culprits behind the dumping themselves. The allegation of law breaking came in a tweet from controversial Standish Independent councillor Gareth Fairhurst who said the Labour clear-up was a pre-local elections publicity stunt. Outraged Coun Davies - who lives in the village but represents Wigan Central - and Mrs Parkinson sought immediate legal advice and sent Coun Fairhurst a letter demanding a retraction and an apology, which he dismissed. But it has now been decided by party chiefs that although Coun Fairhurst’s tweet was libellous, a recent change in the defamation laws makes legal action too expensive to proceed with. In a joint statement Coun Davies and Mrs Parkinson said: “Following a complaint to us from a resident about a sofa and other furniture having been dumped off Bradley Lane, we reported it to the council, who quickly removed it. We did this because firstly it was an eyesore and a dreadful advert for our town and secondly, we knew that the current councillors who represent Standish would not do anything about it because there was no publicity in it for them. “We also put out a press release asking residents to report anyone they saw flytipping, with contact details of the council’s disposal service. “Coun Gareth Fairhurst tweeted that we had dumped the furniture ourselves and then taken a picture of it for our own political purposes. “This was a blatant lie and he knew it to be so when he made the allegation. We wrote to him and asked him to retract and apologise, but his response was to repeat the lie. “We took legal advice as we do not believe anyone elected to public office should be allowed to knowingly tell lies to their constituents. “Unfortunately, a recent change in the law has made it impossible for ordinary people to sue for libel as we would have wished due to the enormous costs that it would now entail. 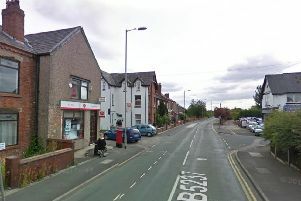 “While it is disappointing, we are satisfied that Coun Gareth Fairhurst has revealed himself as an open and blatant liar and the people of Standish must know that anything he says must be treated with extreme caution and he with utter contempt.” However, a defiant Coun Fairhurst declined to apologise for the tweet and dismissed Labour’s insistence that its content was libellous. He also insisted that the public of Standish were “sick to the back teeth” of his political opponents’ “publicity stunts.” Adding: “They say that they didn’t clean the site up for publicity yet as soon as they had done it they put it straight on their website.